Submitted by zippytex on Sun, 2010-07-18 03:00. On ebay number 200479017991 is for a box of new 3-ring binders with clear-vu plastic. It is for 5-1/2 by 8-1/2 paper. It has 1 and 1/2" round rings. However, they come in a case of 12 for 20.00. But maybe he could be talked into selling them in a lesser amount. 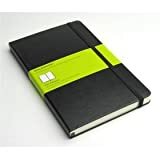 Just thought someone else might need a large ring notebook. Also, number 140402417878 on ebay looks good. It is a 3 ring classic size but with 1/2" rings. Submitted by ygor on Sun, 2010-07-18 15:46. ...it would be worth buying a case and divvying it up. but only if I could get enough advance requests. That other auction is going to cost you $12 per binder ($9 + $3 S&H) and the rings are 1/3 the size. Submitted by zippytex on Wed, 2010-07-21 21:06. Count me in for one. Thanks.